As Cho-Manno's Blessing enters the battlefield, choose a color. Enchanted creature has protection from the chosen color. 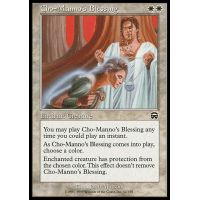 This effect doesn't remove Cho-Manno's Blessing.